Lens testing madness | Windsor Photo Outfitters...Exposed! There’s not much to get the photographic eyes rolling more than lens tests. 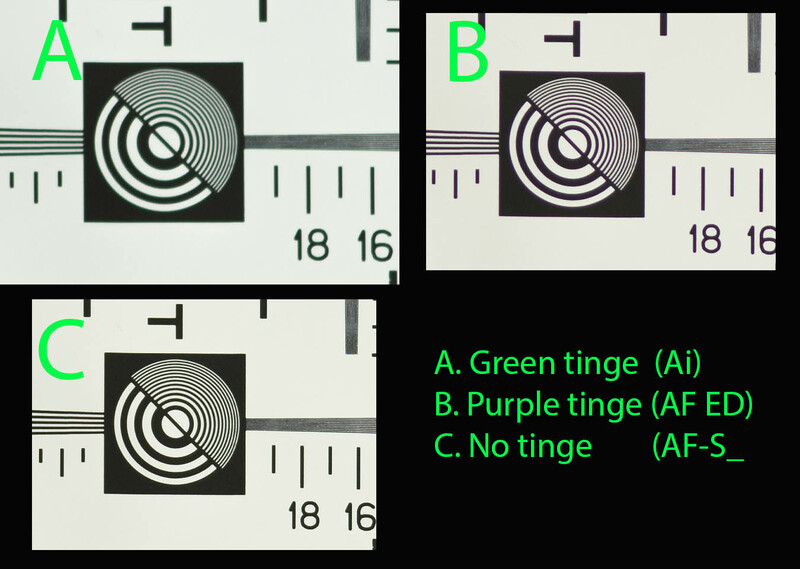 We all want to know how well our lenses perform – but then again, do we really want to know? And the testing process is usually mind-numbing to boot. Still, when an opportunity presents itself, you have to rise to the occasion – such as the other day when I realized I had access to four generations of one particular type of lens. This was the modest Nikon 300mm telephoto with apertures of f4.0 to f4.5. I say “modest” because such lenses are in reach of the stretched photographic budget – whereas the f2.8 “dream” 300mm’s are much more costly. Back in 1964, Nikon introduced its first 300mm for the Nikon F mount cameras, with a maximum aperture of f4.5, and it sailed alone in the product line for apparently 13 years before it was joined by the luxury f4.5 ED and f2.8 ED versions – so long as you don’t count zooms like the 50-300mm which enjoyed limited popularity. I happened to come across a late 1970s version of that original f4.5, so it not only had Ai coupling, but also likely benefitted from better coatings than those made in the 1960s. Then I acquired a similar vintage f4.5 Ai, but with the ED (extra-low dispersion glass) and IF (internal focus) designation. This lens was introduced in 1978 and sold for quite a premium over the basic version, so both stayed in the catalogue side-by-side for a few years. The next lens I was able to borrow – the late 1980s version of the autofocus f4.0 IF-ED, which probably qualifies as the most handsome of bunch with its black crinkle-finish barrel. 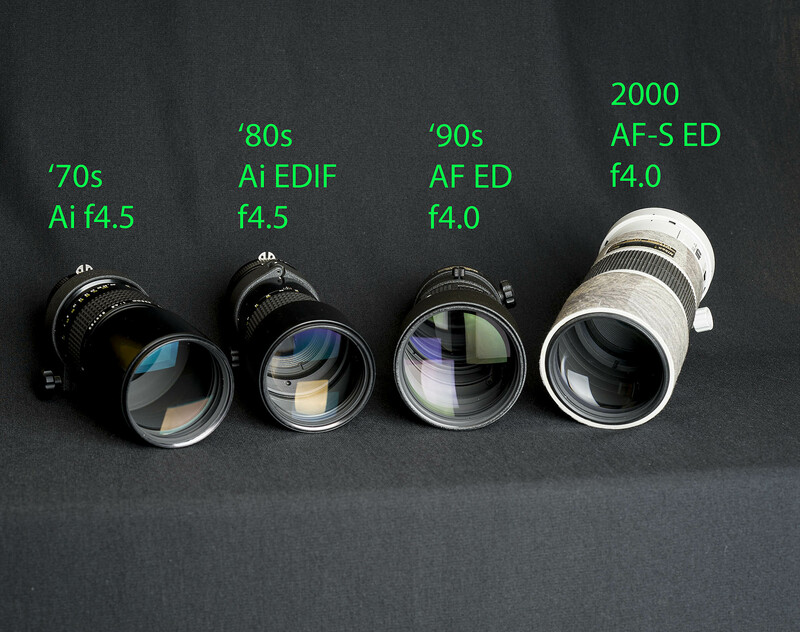 The last lens is my own f4.0 AF-S, which was introduced in 2000. Why my lens is the special order grey finish is a long story. You may admire the camo tape I added to the barrel, but be rest assured it peels of easily. What I don’t have is an example of the latest version of the f4.0 AF-S, which now boasts a fresnel lens to reduce size, and also a VR stabilization system. 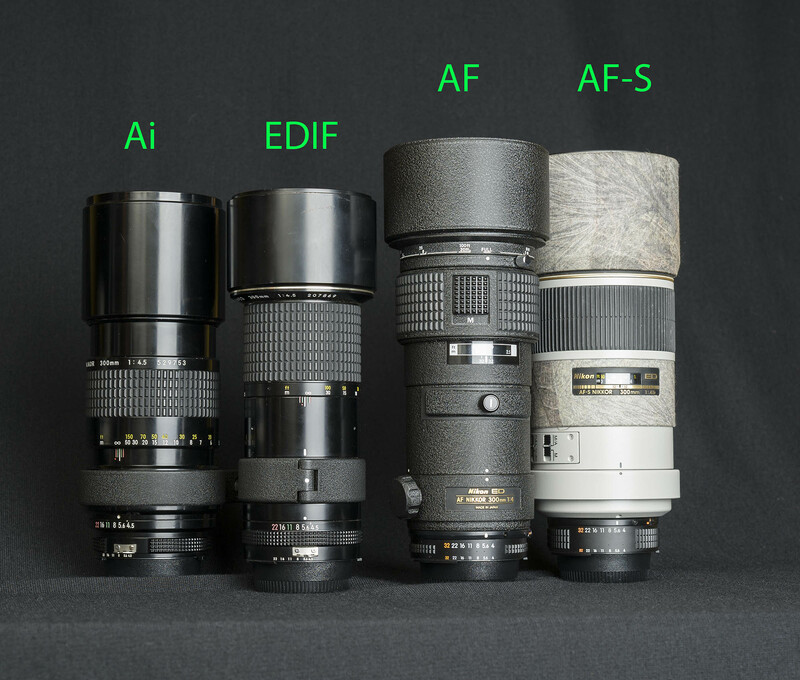 Here’s a small table to explain the four lenses, and their basic differences. So we see the newest lens is the biggest and heaviest, but does focus closer, and faster. Nice. As I said before the AF lens is the prettiest. The EDIF f4.5 is noticeably skinnier and weighs much less than the rest. The original f4.5 Ai has stiffer “unit” focusing, but its tripod collar has nice click stops at 90 degrees, and is the only collar not removable. Okay, now what? So let’s test them… ughh. Out came the test target for the first round and I set it up around 5m from the camera and lit it with flash. I shot images at full aperture, f5.6 and f8.0, and then one shot with each teleconverter (more on that later). I didn’t bother with smaller apertures, as I don’t really care which 300mm lens is best at f16. I also only shot with the 2x teleconverters at f5.6 – an effective f11 – again because shooting at smaller apertures at an effective 600mm almost never comes up (well, see my eclipse shot for an exception to that). I then took all the lenses outdoors for a distant “brick wall” test of a building under daylight, with some out of focus foliage in the foreground. And then came the analysis… ughh, again. Click on the pictures to get a closer look. Cropped from the very centre of the test chart. All wide open. 1. Well, there’s no denying the earlier f4.5 Ai lens was at a definite disadvantage. It wasn’t as sharp as the rest, and its blacks on the test chart were green tinged. Sharpness improved clearly at f8.0, however. It also had slightly more magnification when focused down to 5m due to its unit-focusing design. The other three lenses have internal focus, and the image doesn’t “grow” as you focus closer. 2. It’s not hard to see why the f4.5 EDIF was sought after by those who could afford its premium price. Not only smaller and lighter, and closer focusing, it was sharper and more contrasty than its predecessor at the wider apertures. Shadow detail however, was purple tinted on this one. 3. The f4.0 AF lens is close in quality to the manual focus EDIF, but obviously offering a 1/3 stop brighter aperture through its much larger front objective – and autofocus, of course. Otherwise, the earlier MF version may have had a slight edge in contrast and colour. 4. What surprised me was how differently the newer AF-S lens performed. Evidently Nikon did more than just change the focus motor system. It was contrastier, and had no colour cast on the black parts of the test chart. There was less of the red-cyan fringing than the other lenses, but all four exhibited some. Fortunately, these days that can be readily corrected in Photoshop or Lightroom. 5. Outdoors, things were a little less obvious than on the test chart. You’d be hard pressed to tell most of the shots apart, at any of the apertures. A close look revealed the old Ai lens was a bit softer, but then it exhibited better “bokeh” on the out of focus tree leaves than did the internal focus lenses – again typical for the breed. No doubt we could imagine other “real world” test scenarios to see where each lens passed or failed, but lens testing is tedious and annoying, and the weather’s getting colder. 6. However, the other test I performed was with two of Nikon’s old manual focus 2x teleconverters, since I also had both on hand. 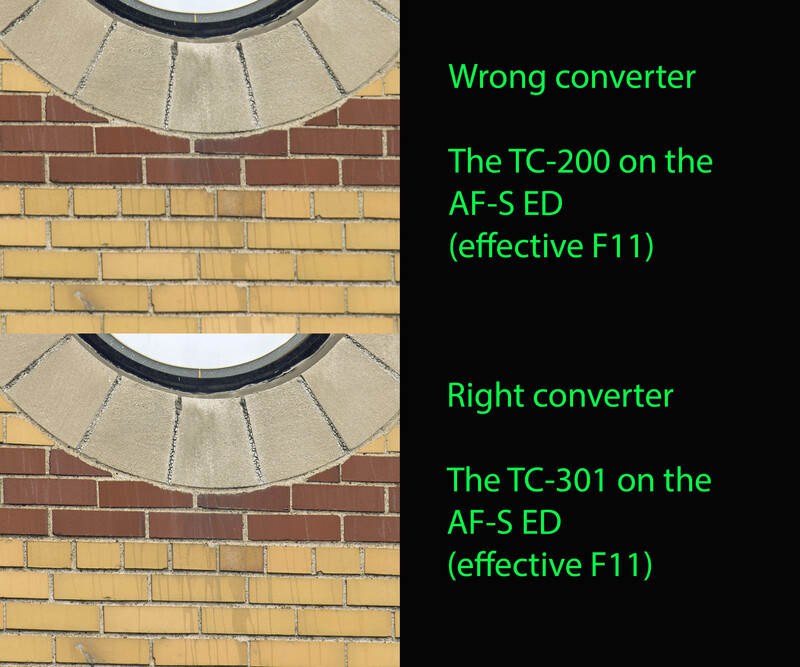 I’d done this test before, many years ago, and came to the conclusion that my 300mm AF-S did better with the “wrong” TC-200 converter than the more exotic T-300/301. The TC-301 can only be used with lenses that allow its nose to poke right inside the back of the lens’ mount – like all these 300mm’s. 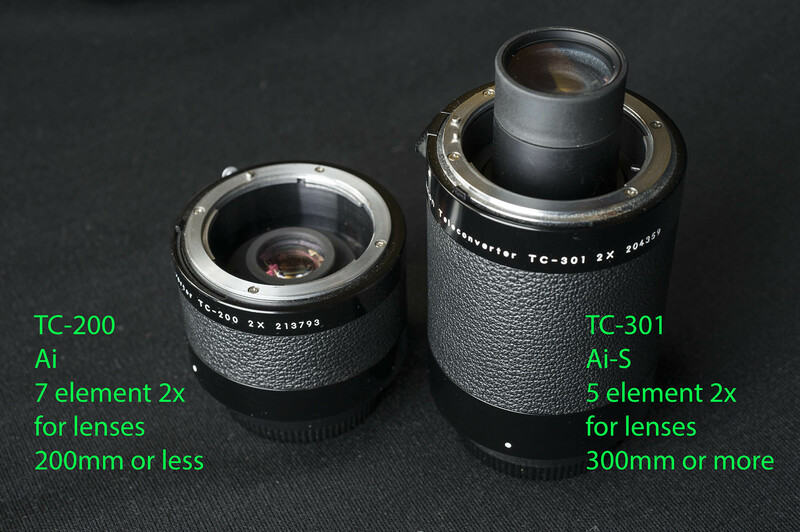 I can only say that back then, I either had a defective TC-301 (unlikely) or I was mistaken in my conclusions, because in this test, every lens did better with the TC-301 than my old TC-200. Much better, I might add. Crap, I’ve been using the wrong teleconverter all these years. Fortunately, I don’t use it all that often. Mind you, the TC-200 fits all the rest of my lenses, whereas the TC-301 only fits long teles. So, in conclusion, I can say I was pleasantly surprised to find that newer, was indeed better. 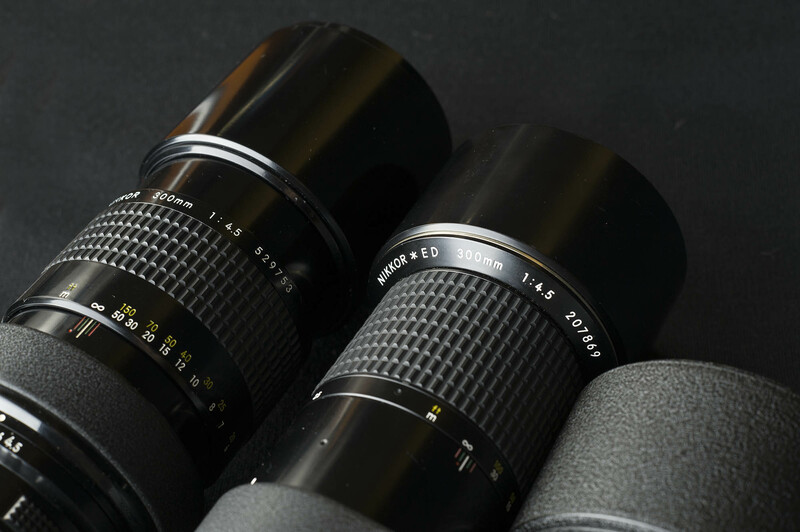 While we often fear that things “aren’t made like they used to” these lenses all showed steady improvement over the years. And yes, when Nikon said the TC-301 was the right teleconverter for the job, I should have believed them. On the downside though, while this test is interesting, it plays to a small audience. 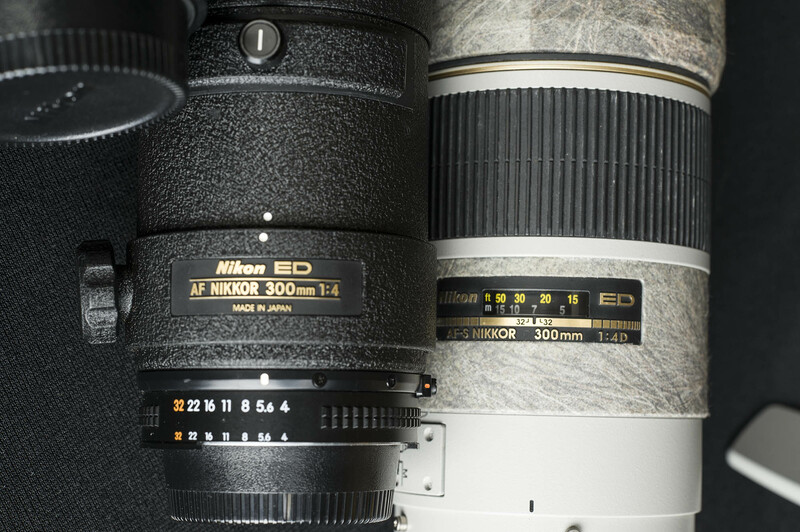 Prime 300mm lenses are quite seldom seen in today’s marketplace. 300mm isn’t really long enough for wildlife, and besides, many budget zooms offer 300mm at f5.6 at their long end. Who wants to pay three or four times as much for a 300mm one stop brighter? You don’t see many Canon or Pentax 300mm 4.0’s either. So, maybe I should be testing these prime 300mm’s against the popular zooms. Damn, out comes the test chart again. ~ by windsorphotooutfitters on October 10, 2015. This entry was posted on October 10, 2015 at 2:27 pm and is filed under Uncategorized.You can follow any responses to this entry through the RSS 2.0 feed.You can leave a response, or trackback from your own site. Next: Meet the K-iR – or is that K-Ir? Whatever.